The industry’s most rugged wiper seal is co-molded from two types of chemical and chlorine-resistant materials. 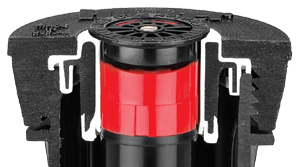 This pressure activated, multi-function wiper seal reduces flow-by, operates at low pressures, and allows more sprinkler heads to be installed on the same zone. Its innovative design prevents debris from entering the seal when the riser is retracted, reducing riser stick-ups.